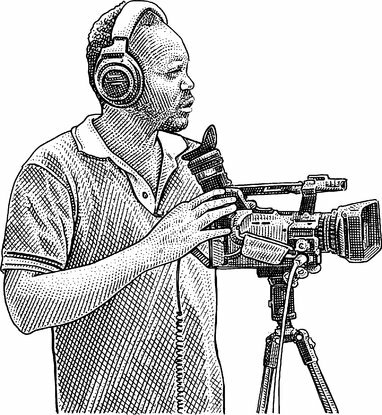 Wakaliwood is home to Uganda's growing film business—low-budget action movies produced and directed by Isaac Nabwana. The former street vendor-turned filmmaker has been dubbed ‘Africa's Tarantino’ for his violent, high-octane comedies. KAMPALA, Uganda—On a potholed road next to an open sewer, four men faced off in a Kung Fu battle. A khaki-clad soldier ran up, firing a machine gun fashioned from old lawn-mower parts. Two cannibals caked in mud and dried grass approached the bloody corpses and licked their lips. Welcome to Wakaliwood, a movie studio and production house that is riding a wave of popularity in East Africa and drawing a cult following overseas, with crowded screenings in Hong Kong, Stockholm and New York. Based in a ramshackle Kampala slum called Wakaliga, Wakiliwood churns out a movie a month. The average cost, say the filmmakers, is about $180. The thrifty theatrics are the brainchild of Isaac Nabwana, a local resident who has made 45 feature-length movies in the slum. Dubbed “Africa’s Tarantino” for his high-octane, violent comedies, the director cites Chuck Norris, the Rambo movies and television’s cop classic “Hawaii Five-0” as inspirations. His movies, including “Ebola Hunters,” “The Cannibals” and “Valentine: Satanic Day,” fill theaters across the country and have been watched millions of times on social media. “My aim is to entertain the world,” Mr. Nabwana said recently as he briefed his Kung Fu fighters and cannibals before another take. "Uganda has lots of problems, but look at what we’re creating here. Soon I hope Mr. Tarantino will be compared to me!”, referring to American director Quentin Tarantino. A 47-second clip from Mr. Nabwana’s violent action comedy “Who Killed Captain Alex?” has been watched on Facebook more than 11 million times. A Kickstarter campaign Mr. Nabwana hoped would raise $200 garnered almost $15,000. He used it to buy cars and trucks to blow up on screen. That’s a big cash injection for a studio that relies mostly on community help. The actors, with stage names like Jet Li and Apollo Creed, are local volunteers who drive moto-taxis and sell vegetables at roadside markets. The weapons and vehicles used as props are made from scrap metal and car parts. Mr. Nabwana edits his films at home on computers he assembled from discarded motherboards and keyboards. 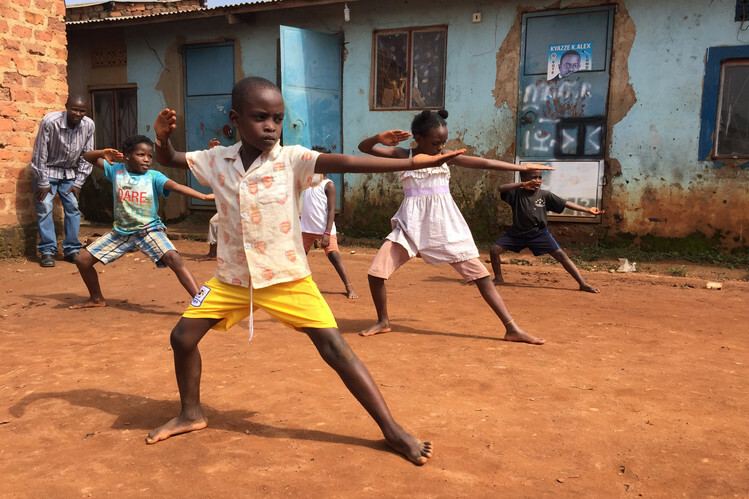 Local children, including Mr. Nabwana’s daughter, Rachel, train for roles at Wakaliwood’s in-house Kung Fu school, run by actor and Wing Chun expert Bukenya Charles, who calls himself Bruce Yu. Ugandans accustomed to watching movies from Hollywood and Nigeria's silver-screen juggernaut, Nollywood, have flocked to the dramas set in familiar places. Wakaliwood’s success persuaded a 45-year-old New Yorker, Alan Hofmanis, to move to the slum. After his girlfriend dumped him in 2012, he happened to see a Wakaliwood clip at a Lower East Side bar. He traveled to Kampala days later. Now known affectionately as the muzungu, or white foreigner, he writes, co-directs, acts and promotes the movies abroad. Local children train for movie roles at Wakaliwood’s in-house Kung Fu school. Messrs. Nabwana and Hofmanis are making Uganda’s first action trilogy, about Joseph Kony, the infamous Lord’s Resistance Army leader. They hope it will be screened this year at the Cannes Film Festival. “People get very confused that we’re making successful movies from a slum,” said Mr. Hofmanis. Camera cranes and tripods are made from tractor parts and other scrap. To re-create gunshot injuries, Mr. Nabwana’s wife, Harriet, fills condoms with fake blood. “We used to fill them with real animal blood, but actors got sick with a disease passed on from cows. So we switched to food coloring,” she explains. In addition to her costume-direction duties, she acts, runs rehearsal workshops and does camera work. Wakaliwood’s mechanical mastermind is Dauda Bissaso, an actor also known as “the equipment from scrap metal. Mr. Nabwana calls him “a genius with a blowtorch.” He built one weapon based on the huge machine gun used by Arnold Schwarzenegger in “Predator,” using a motorcycle engine to rotate the barrels. “I never went to school, but I watched engineers and mechanics, and I knew my brain worked the same way,” Mr. Bissaso said recently while demonstrating how a harplike musical instrument fires bullets from hidden chambers. “I got the idea for this from the Antonio Banderas movie ‘Desperado,’ ” where guitar cases housed heavy weaponry. Mr. Bissaso is putting finishing touches on a full-scale fake helicopter. Mr. Nabwana said he long coveted a chopper and remembers being chased by one as a child during Uganda’s civil war. Although actors and crew work for nothing, they get to keep half the profits from any DVDs they sell on the street. “We do man-to-man, door-to-door all over the country to sell them,” said Mr. Nabwana. Nearby, a young volunteer was hunched over a stack of DVD burners. The films sell for up to 3,000 shillings—about $1—and the team has a window of only about one week before they are pirated. They often travel in full costume, as commandos, cannibals or zombies, to maximize sales.